Wayne Faust - Secret Career! What does Wayne do during those long days on the road? He writes fiction, mostly of the science-fiction, alternate history, and light horror variety. He's also written some Christian fiction as well. He's had over 30 pieces published and even won a contest with one of his stories, with more being published all the time, so stay tuned to this site. If you're a fan of tightly-written fiction and you've got some reading time, click on the links below! "A Sharp Stick In the Eye." Wayne's tale takes place in Key West during Fantasy Fest. Wayne's story "Outside the Box" appears in a great new anthology from Mad Cow Press about dinosaurs. Check out Wayne's new sci-fi, horror novel, "Europa Nightmare," co-written with Charles Eugene Anderson! Read an interview with Wayne and his co-writer on "Europa Nightmare," from a Science-fiction blog. Check out Wayne's new Author Page on Amazon. It includes links to lots of the magazines he's had stories in, and some of his books. Wayne's new book, "12 Parables" is now available! Wayne received a really nice honor from One Night Stand Theater in Denver. He is now a "7Nighter," meaning his stories have been performed more than 7 times! This means a lot to Wayne because he always loves their treatment of his work. Wayne is a hockey player, playing in two beer league teams a week. He also writes science-fiction. His real job is making people laugh. So it's no surprise that he wrote a funny science-fiction story about hockey! 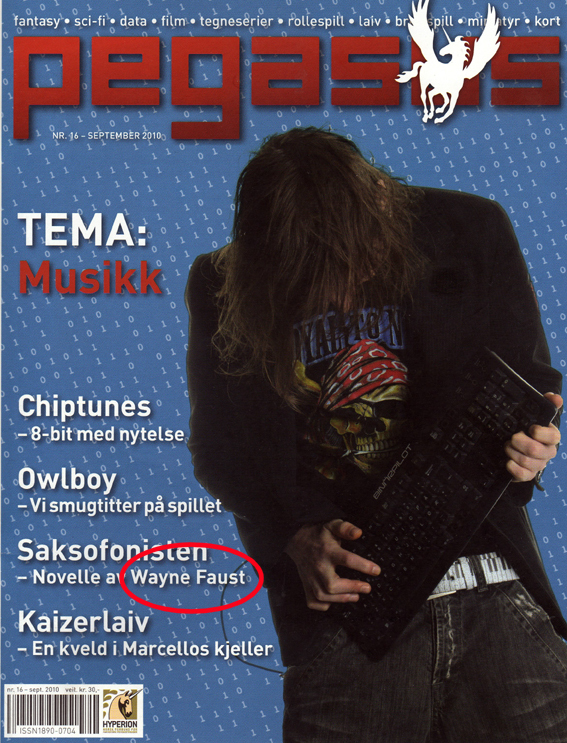 This one appears in the April 17th, 2017 edition of Piker, a magazine that Wayne's been in six times! A nice, poignant and sentimental Christmas tale from Wayne. It appears in the Winter, 2016 edition of Halcyon Days, who also published Wayne's story "Mother's Day" in 2014. Originally read aloud for Colorado Home Grown Tales, December 2008. READ ONLINE FOR FREE by clicking on the story title above. 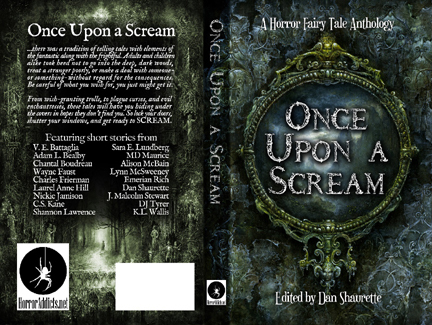 Wayne just landed a story in a brand new horror anthology. This is a terrific project and he's proud to be a part of it. You can see it on Amazon and check it out by Clicking here! "Sunny's Side Of the Street"
Featured in a live performance for One Night Stand Theater's show on April 10th, 2016. This was Wayne's NINTH story performed by One Night Stand Theater! 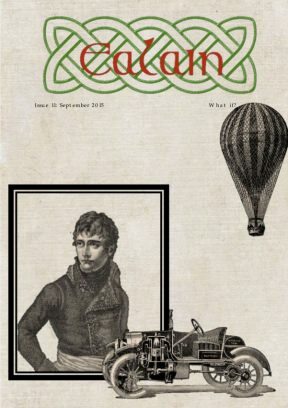 Published in the September 2015 issue of Ealain, an excellent online magazine in South Africa. The theme for this issue is "What If?" and Wayne's story about a different outcome of the American Civil War certainly fits the bill. You can by the magazine, which contains lots of great stories from around the world, for only $1.99. Or you can subscribe and get lots and lots more stories for a very reasonable price. Featured in an absolutely mesmerizing performance by actor Logan Custer for One Night Stand Theater's show on April 12th, 2015. This was Wayne's EIGHTH story performed by One Night Stand Theater! a really nice online magazine. Appears in Volume X, Issue 1 of Tales Of the Talisman. and lots of good stories. Click on the cover to the left to go to their website. and also about playing in Ohio! This story was also read aloud for Colorado Home Grown Tales, February, 2011. This story is one of the few that Wayne has written that firmly falls under the category of "HORROR." Not for the faint of heart or stomach, it's a gripping tale that should keep you hitting the 'page down' button on your computer. It originally appeared in the March 26th, 2010 issue of Afterburn Science-Fiction Magazine. 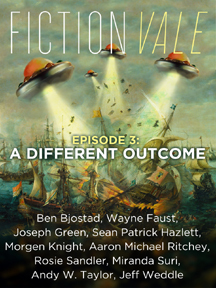 Appeared in Episode Three of Fictionvale Magazine. This is one of the bigger magazines that Wayne has had a story in, and it was for their Alternate History issue. It's one of Wayne's best stories, and concerns some travelers from the future who venture back to the Black Plague years in France. 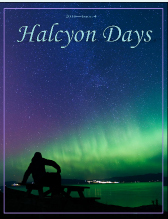 This is Wayne's first story in Halcyon. This tender, family piece was inspired by an east coast comedy tour that took Wayne to Virginia and Washington, DC. READ ONLINE FOR FREE by clicking on the story title above or the magazine picture above. Then scroll through the pages. Wayne's story begins on page 20. Originally published at Lodestar, and was their first place fiction contest winner. Appears in the Fall, 2013 issue of "GlassFire Magazine." This is Wayne's first story in GlassFire. It was inspired by several of Wayne's trips to Yuma, Arizona when his son and family lived down there. There's also some ballroom dancing in this mysterious little tale, inspired by his wife. READ ONLINE FOR FREE by clicking on the story title above or the magazine picture to the left. Then click on the story name on the cover. Featured in One Night Stand Theater's October, 2013 performance of "Ghosts" at The Vintage Theater in Aurora, Colorado. It originally appeared in the September, 2013 issue of Cover Of Darkness Magazine. Appeared in the Summer, 2013 issue of "Lissette's Tales Of the Imagination." 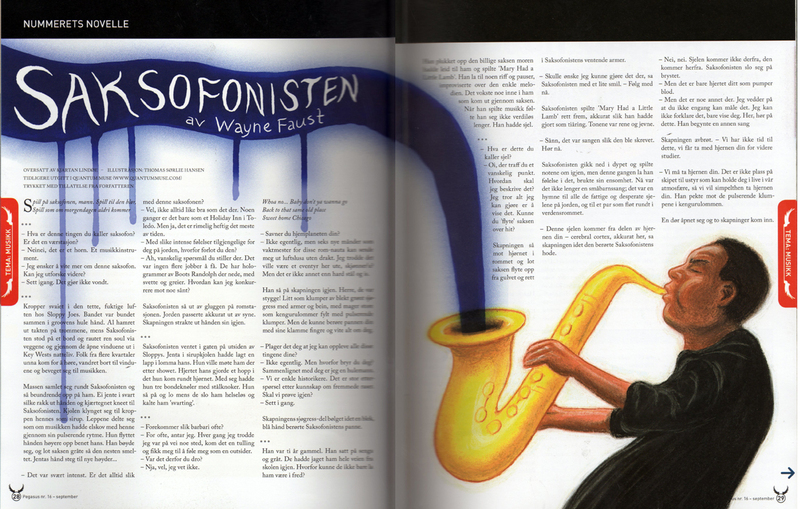 This is Wayne's first story in Lissette's, an excellent, hard copy magazine featuring historical fiction and fantasy. "Arthur's Bane" is a whimsical story with a new take on the King Arthur legend, and it improbably features a twist for Chicago baseball fans! This is Wayne's first story for FlagShip, an excellent magazine. You can read this one online for free, but you can also download a PDF version of the entire magazine for only $2.99, an MP3 audio version of all the stories for only $2.99, or BOTH for only $3.99. This is a really good deal, and it's an attractive magazine with great illustrations. 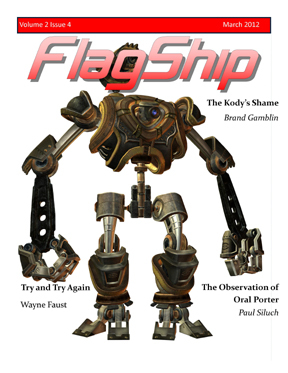 Click on the magazine cover or the links to go to Flagship's website. 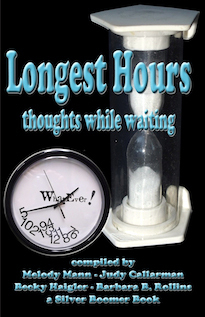 "Waiting For the Next Move"
Appears in the Anthology "Longest Hours" from Silver Boomer Books. Click on the book cover on left to find out more about the book. This is Wayne's 5th story in Tales, and the first time his name appears first on the cover! 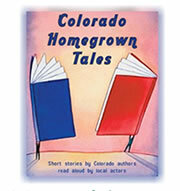 this heartwarming tale was originally read aloud for Colorado Home Grown Tales, May, 2010. Wayne's 5th story with Piker Press. This one appears in the April 9th, 2012 issue. Piker seems to like Wayne's quirkier stories, and this one definitely fits. This is Wayne's first story for Eric's Hysterics, a humor magazine. And yes, this is a very funny story inspired by his years back in Chicago, hanging out after shows with his friend Dave Schneider. This is Wayne's first story for Niteblade, a great online Horror and Fantasy magazine. It's also his first which takes place back at dear old Taft High School in Chicago, where Wayne went to school a long, long time ago... This story appears in the March, 2012 issue. If you click on the story title above, you can read the first half of the story. To read the rest, you have to buy a pdf of the magazine for only $1.99. And for that, you get all the great stories in the current issue and you help to support fiction writers! 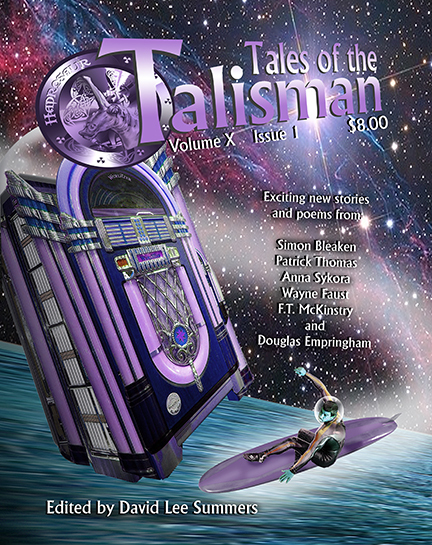 "Eight Bar Blues And You Ain't Goin' Home"
Wayne's 5th story for Tales Of the Talisman. This is a really nice magazine, and if you like good writing and good speculative fiction, you should order yourself a copy. Wayne's story relies a lot on his early days on the Chicago music scene, and takes place in a future Chicago, with a blues singer that seems really out of place. Wayne considers this one of his best tales. 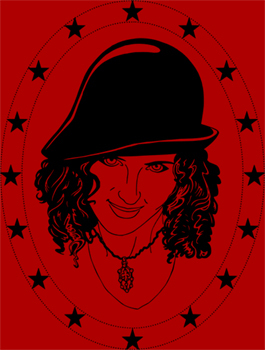 This is the 3rd story of Wayne's that was performed by One Night Stand Theater in Denver on April 17th, 2011. Wayne's 3rd story with Piker Press. This one appears in the March 14, 2011 issue. Piker seems to like Wayne's quirkier stories, and this one definitely fits. But there's a strong underlying message to this one. 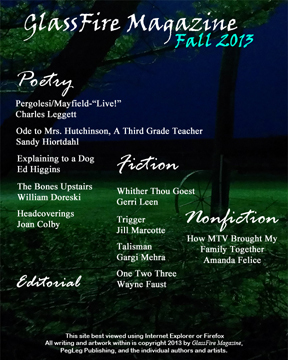 Wayne's first story for The Absent Willow Review, a very cool online magazine. This story appears in the December 15th, 2010 issue and is a creepy little tale that takes place in Chicago. 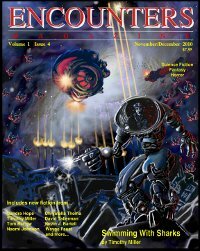 Wayne's first story in "Encounters" Magazine, a nice, slick, sci-fi publication. This story appeared in the November / December 2010 issue. "Wind Like Dry Bones" is a spooky, atmospheric piece that takes place just before Christmas in a remote, southwestern village. Published in the November, 2010 issue of "Joyful" Magazine. "A Place For Second Chances"
Wayne's 3nd story in "Tales Of the Talisman." It appeared in the August 2010 issue. This is his first published story using Carthage College as a backdrop. 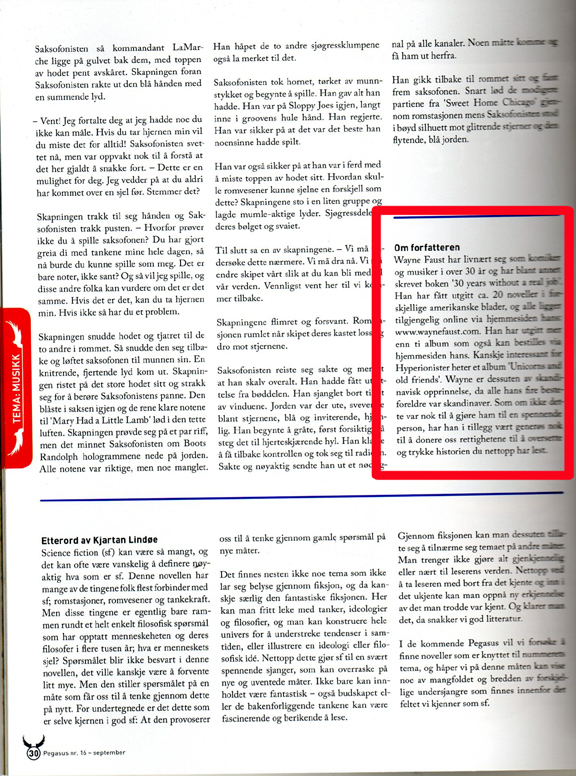 Translated into Norwegian and published in the August 2010 Issue of "Pegasus" Magazine in Scandinavia. Published in the September, 2010 issue of "Eclectic Flash" Magazine. Published in the September, 2010 issue of "Joyful" Magazine. "Symphony Of the Water Buffalo"
Wayne's 2nd story with Piker Press - this one features a story about Chester P. Farnsworth, one of Wayne's creations way back in high school. In this story, Wayne experiments with a quirky, humorous writing style not found in his other stories. Published in the August, 2010 issue of "Joyful" Magazine. Published in the April 2010 issue of "Joyful" Magazine. This little story was inspired by all the times Wayne visited his wife's family dairy farm in Dane County, Wisconsin. There's lots of Scandinavian humor, which should probably ring true, since Wayne has been doing this kind of humor in his shows for over thirty years! With this published story, Wayne was the featured cover author for the March, 2010 issue of Piker Press. The first fiction story Wayne wrote when he got back into writing. It was published in the November, '09 issue of the Australian Horror magazine, "Midnight Echo,"
even though it's all about driving across Nebraska in the middle of the night. "Jake and Russell Take A Peek"
Wayne's 2nd story in "Tales Of the Talisman." 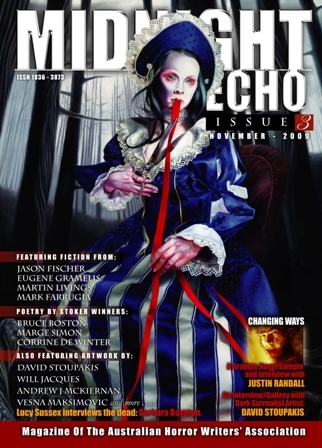 It originally appeared in the August '09 issue. This is his first published story using Colorado as a backdrop. Honorable Mention - Writer's Digest Magazine Story Contest, Inspirational Category - 2008. Published in the September 2009 issue of "Joyful" Magazine. Also read aloud for Colorado Home Grown Tales, February, 2009. Published in the October, 2008 Issue of Hungur Magazine. Also read on the radio by actor Guy Williams at KGNU - Boulder, Colorado for their "Stories For All Seasons" program. Also read for Colorado Home Grown Tales, December, 2007, December 2009, upcoming December 2010. Originally published in the April '08 Issue of Tales Of the Talisman. Originally published in the Denver Rocky Mountain News, October 2007.